No visit to Chinatown would be complete without sampling Chinese food. Probably the most famous restaurant among tourists in the area is the new Gonghwachun, the original Jajangmyeon maker. Take note, however, that many locals say the new location isn’t as good as the old one and lines to get a seat can get pretty long. Jin Heung Gak, another local favorite, serves up Jajangmyeon and sweet and sour pork. 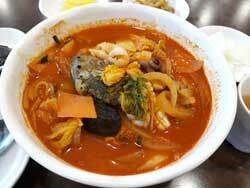 The restaurant also serves Jjambbong, a Korean spicy noodle soup that is very common in Korea. At Jin Heung Gak, however, their signature Jjambbong comes topped with abalone and sea food (KRW 6000-8000). It wasn’t as spicy and the taste of the soup was not as strong as I expected. If Jin Heung Gak is too crowded, try Joong Hwa Ru, a good alternative if you’re hungry and don’t want to wait.